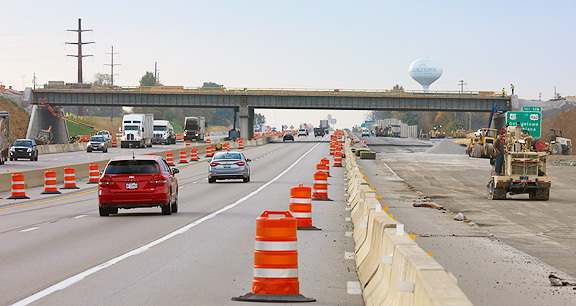 Project obstacles and solutions: The Kentucky Transportation Cabinet announced in June 2014 that it had approved a new $26.4 million interchange on I-75 on the north side of Georgetown in Scott County, Kentucky. The new interchange was built to relieve traffic congestion, particularly during rush hours around the Georgetown Toyota manufacturing plant. Scott County is the fastest growing county in Kentucky due to the expansion of the Toyota plant. The new interchange will link I-75 to the new KY 3552. This new highway also intersects KY 32/Champion Way and links it to US 62/Cherry Blossom Way. ATS Construction provided all of the paving, curb and gutter and barrier wall work on this project. Central Bridge built the overpass bridges and ramps. The new interchange was originally scheduled to be opened in the spring of 2017. Work began on the new interchange in March 2015. There was considerable pressure to move that date up to the end of 2016, especially with the expansion of Toyota. ATS and Central Bridge met with IMI to see what could be done to speed up construction in the later parts of the project. This included larger orders and expanded delivery times on the parts of the job that were formed with a slip-form paver, such as the curb work and the barrier walls. Typically these are poured in smaller sections because of the slow pace of the machinery. ATS was pouring up to 1,700 feet of barrier wall per day to speed up the schedule. In total, IMI supplied 15,000 yards of concrete for this project. ATS was able to complete their work ahead of the schedule and the new Scott County interchange opened on December 15, 2016. For more information on scheduling large concrete pours, contact the sales representative for the concrete plant nearest your location. Click here.